Meet single Colombian women eager to meet foreign men in our tour groups. Welcome to Colombian Women! A matchmaking site that is one of the most respected international dating agencies helping you to meet Colombian women seeking marriage to American and other foreign men. In Colombia, you can find a tall and lean super model-like characteristics and you can also find those with voluptuous body. Their hair ranges from blonde to black; eyes from dark to light, and their sizes from tall to petite. You probably could not find the most charming diverse beauty anywhere in the world but in Colombia. They just naturally have the right mix of curves, color, character and charm! But wherever you are in the country, the femininity and traditions of these singleLatin girls are what makes them so lovable and special. Blame it on history, sicnce people in this South American country are a beautiful cross of European, African, Indigenous and those in between. Searching the entire country to find the best woman who fits your taste in marriage for a wife will be a fun singles adventure. Or you may sign up and browse our personals of Colombian women's profiles to take the quickest route. Our site here has thousands women's personals with photos of beautiful and marriage-minded Colombian ladies from Barranquilla, Cartagena, Cali, Bogota and Medellin. Bogota’s “Rolas” who are characterized by their brown hair, brown eyes, and petite structure; are said to be intelligent, liberated and witty. Cartagenas’ “Cotenas” have sun-kissed skin, and are known to be the friendliest and most laid back in the bunch. Medellin’s “Paisas” are famous as the hottest and sexiest women in all of Colombia. Cali’s beautiful “Calenas” are the most beauty conscious and open-minded. While the “Costenas” in Barranquilla have the most voluptuous curves as the most exotic ladies in the group. But how are they as a bride? While they have the beauty, would they make a wonderful wife? Age difference is not a big deal to them, in fact, their culture see it as “normal.” But that’s not all they do. 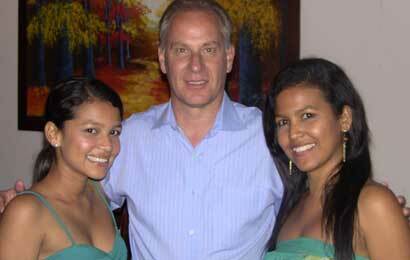 Most Colombian girls are educated, so they can work and take care of family without being heavily demanding of the material things she may think she deserves. Why they are drawn to foreign gentlemen is often because many of them simply find foreign men more attractive, responsible and respectful than those in their own latino coutry. Like every normal girl, most Colombian women seek a simple but stable and secure lifestyle in a LTR that results in a traditional, lasting marriage. These stunning women are what you’ve been looking for if you have an attraction for latin girls. Meet single Colombian women while visiting an endless number tourist destinations by joining us on one of our exciting singles vacation adventures to Latin Amercia. We have several Romance Tours conducted every year to help men looking for a charming foreign bride and meet the woman of their dreams. You'll meet hundreds of dazzling, beautiful, qualified ladies who are committed to finding the man of their dreams through our international introductions, singles tours, and socials. You will meet more beautiful Colombian Ladies in one week with us than you probably could in 5 years on your own. The women who join our service are prescreened and are required to complete an application and are often personally interviewed by our staff. They are marriage-minded women and actively waiting for their chance to get matched with a man whose main purpose is just like yours. YOU can meet your Colombian bride for marriage. Our service strives, in every way,to help single men find their loving Colombian woman for marriage. Our marriage agency services not only match you to these enticing women, but assures you of its authentic objective which is a serious, traditional LTR and lifetime relationship. This is where you find a date, of course, with a Latino which everyone dreams to have. This could be your best chance and your best opportunity in love and companionship.